The hip joint is the articulation area between the pelvis and the leg to support the weight of the body posture. 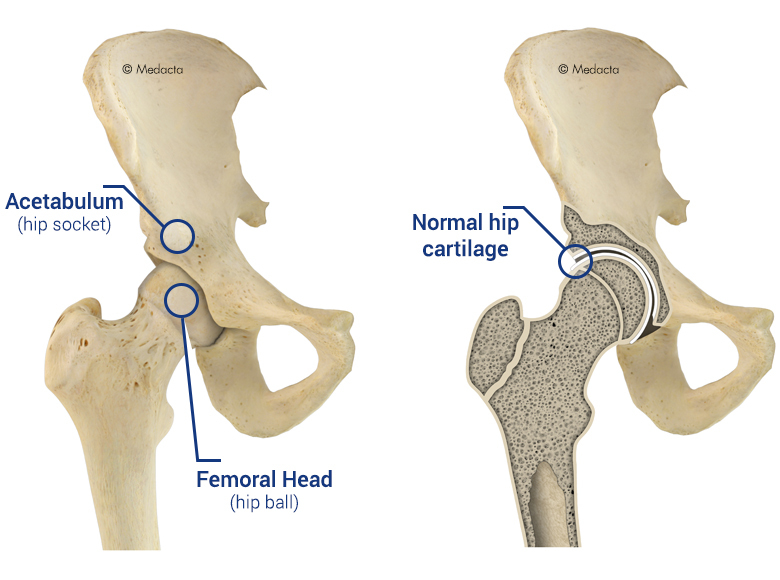 The hip joint is formed by the articulation of the rounded head of the femur and the cup-like acetabulum of the pelvis. It forms the primary connection between the bones of the lower limb and the axial skeleton of the trunk and pelvis. The surface of the femoral head and the acetabulum, where the bones come into contact, is coated with a smooth tissue called articular cartilage. The cartilage, together with a substance called synovial fluid, prevents the bones from rubbing against each other and from becoming damaged.